Annihilate your upper body with UPWOD Nº25. For the second day in a row we’re going BIG with straight power. The Upper Body Annihilation Workout is exactly what it sounds like — a POWER upper body workout that aggressively attacks the chest and shoulders. It hammers both all-in-one with a flurry of power movements—including dumbbell presses, clean & presses, and kettlebell swings—zaps muscle fibers, and forces the region to slap on size and strength. If you’re used to weak, low-intensity chest workouts, giddy up. Do it effectively and you’ll press the life out of your chest and shoulders, bust through plateaus, galvanize fresh new growth, and carve out a hulking upper body that conveys power. 1. [DROP SET] Dumbbell Chest Press — do 12 reps of the dumbbell chest press, immediately drop the weight by 50%, and bang out a second set of 12 reps.
2. [SUPERSET] Incline Dumbbell Chest Press + Incline Dumbbell Flies — do both sets back-to-back. For incline flies, lower down in line with collarbone. 3. Barbell Clean & Press — you can also do these with dumbbells. 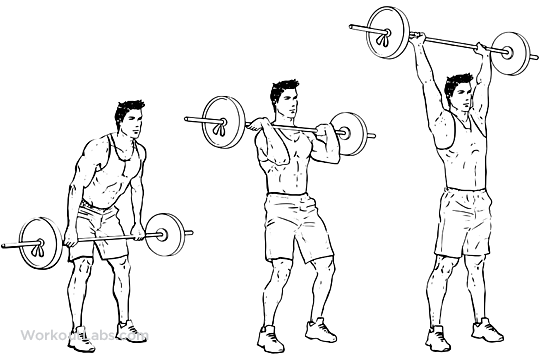 Pull the barbell up, flip your grip, and hold it up by your collarbone. Once it’s there, dip down slightly and explosively press it up overhead. Start with a lightweight and move the motion as fluidly as possible. 4. Kettlebell Swings — you’re doing an ascending rep protocol. Do 15 reps per arm on the first set, 20 on the second, 25 on the third, and 30 per arm on the fourth. 5. [DIP SET] Dips + Push Ups — do 7 dips and then 7 push ups. Immediately do 6 dips and 6 pushups…5+5…4+4…all way down to 1+1. Finish everything as quickly as possible. 6. [SUPERSET] Front Plate Raise + Upright Rows — do both exercises back-to-back. Hold both at the top for 1 second. 7. [DROP SET] Lateral Raises — do 10 lateral raises, drop the weight by 50%, and then immediately do 10 additional reps.
8. Dumbbell Push Press — hold two dumbbells with a neutral grip. Dip down at your knees, explode up, and press the dumbbells over head. Use a light weight and aim for 15-20 reps.